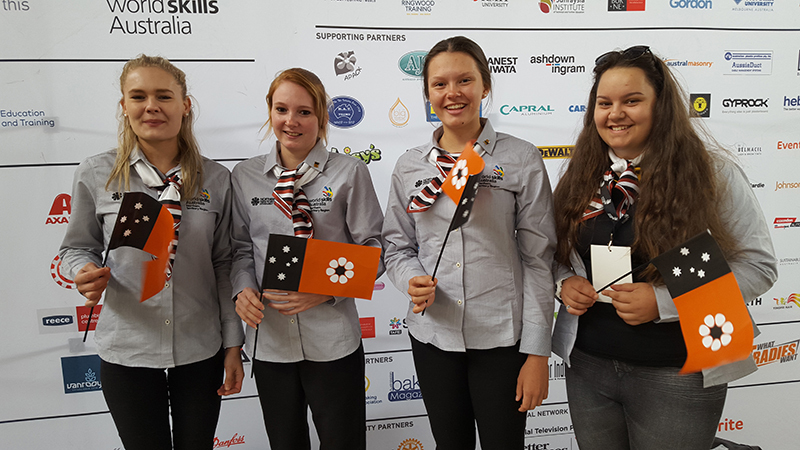 Four young apprentices, trainees and students from the Top End have battled amongst the best in the nation at the WorldSkills Australia National Competition. The WorldSkills National Competition provides an arena for young Australians to showcase their trade and skills, and to celebrate the contribution of the vocational, education and training (VET) sector. Over three days of intense competition, more than 500 competitors participated in the event representing 60 skills at the Melbourne Showgrounds. Georgia English from Darwin took out the gold medal in the VET in schools section, Food and Beverage category. The young student was given top marks for her skills in service of high tea, tapas lunch and a formal two course dinner. The Northern Territory team also included Dannii Tawhi who competed in the VET in schools section, Business category. Chloe Taylor and Jemma Haymen, both from Darwin, competed in the open section of the competition in the Cookery and Retail Baking categories. Territorians have one of the highest rates of VET participation in Australia. The NT VET Sector plays an integral role in the growth of the Territory by skilling and training the current and future workforce. Events such as WorldSkills demonstrate the variety of skills that can be learned through VET, providing pathways into a number of diverse careers.